Location, location, location. It’s true for restaurants and, in the case of Cigars and More of El Segundo, it’s true of cigar lounges. 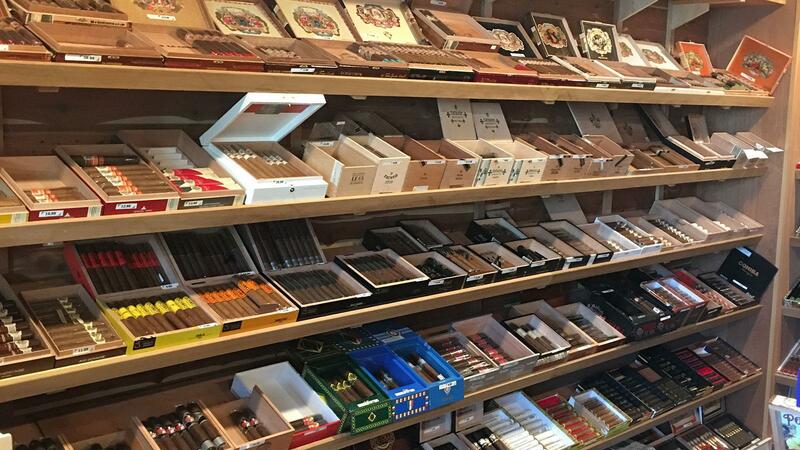 Cigars and More is perfectly located just south of Los Angeles International Airport, a.k.a. a major traffic jam. Now anyone who’s visiting L.A. and has a three-hour layover can enjoy a cigar. Just get in a cab (don’t wait for Uber or Lyft because it’ll take forever) and in less than 10 minutes you can be enjoying your favorite smoke. “We get a lot of travelers,” said Marco Abdalla, manager at Cigars and More. “The closest place to smoke a cigar by LAX is El Segundo, but it’s also central to LA.” If you’re driving on Interstate 405 in either direction, you’ll likely experience a clog of cars at any time of day. Turn towards the ocean and you’ll find Cigars and More. Enter and the humidor is right in front of you. Abdalla said that visitors are delighted to find a great selection of Fuente Fuente OpusX and cigars by Davidoff. He added that the shop sells mostly individual cigars and that the most popular are Arturo Fuente, Padrón, Montecristo, La Aroma de Cuba and Alec Bradley. You’ll also find Tatuaje and Illusione, as well as Espinosa and Room101 among the offerings. “We have something for everybody,” Abdalla said, adding that his favorite smoke is a Padrón Series 1926 No. 9 because it was the first one he smoked with his morning coffee. “Out of the Top 25 cigars this year, we have at least 20 of them,” Abdalla said. “Of course that doesn’t include Cubans.” It does include the E.P. Carrillo Encore Majestic, the 2018 Cigar of the Year. “When the list came out, we sold out quickly.” Lockers, 42 of them, are available for rent at $50 a month, or $550 a year. 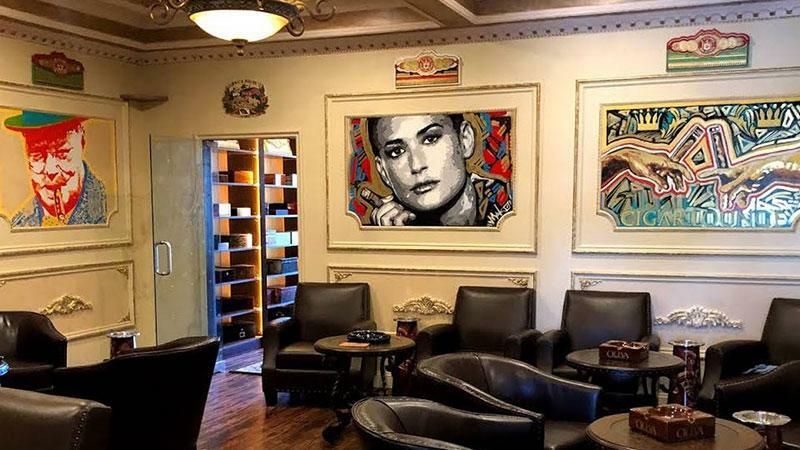 Pick a cigar, then turn left twice out of the humidor and you’ll step into a lounge that seats about 20 and has iconic, cigar-related art painted right onto the walls surrounding three TVs. The back wall has a surprisingly soothing fake fireplace. Branded ashtrays are abundant, resting on tables between the chairs. The humidor inside Cigars and More offers many brands, including Tatuaje, Camacho, CAO, My Father and more. The space used to be a banner and stationery store. It took more than six months to convert it into a cigar lounge. The walls of the lounge are painted white and have a lot of wainscoting. Is the style art deco? Baroque? Po-Mo? Abdalla just calls it “classy.” A chandelier hangs from the middle of the ceiling. The most important amenity here is that the lounge has a back door. Open that and the front door and there is a breeze that keeps the room supremely well ventilated. It doesn’t hurt that the lounge is a half-mile from the ocean. Cigars and More opened just before Thanksgiving of 2018 on the main drag of El Segundo, a city with its own government that is a bit more accepting of cigar aficionados than Los Angeles, city or county. Abdalla says visitors can bring their own liquor if they have a receipt to show they bought it at an outside vendor. You might find this difficult to believe, but the Los Angeles metropolitan area has a lot of places that welcome cigar smokers. Now, the ideal place is one in which you can also get a cocktail. Admittedly, there are not as many around Los Angeles as one would like, but there are a few more than you might expect. “It’s BYOB. You can’t stop people, but we ask that they be respectful,” Abdalla explained. Cigars and More sells soft drinks and five kinds of coffee, from drip to cappuccino, and has a dedicated ice machine. The lounge does not allow food to be brought in, but there’s a pho shop next door and a BBQ joint across the street, among the numerous restaurants in the area. Cigars and More is still finding its footing. As of this writing, the store had not yet held its grand opening event. Look for special events to be announced soon, including football viewing nights and live music. In the meantime, plan on making good use of your layover. Or just arrive very early for your flight and enjoy your favorite cigar before taking off. Open Monday through Saturday: 10 a.m. to 11 p.m.